Doesn’t this photograph bring a sense of calm? It sure does for me. 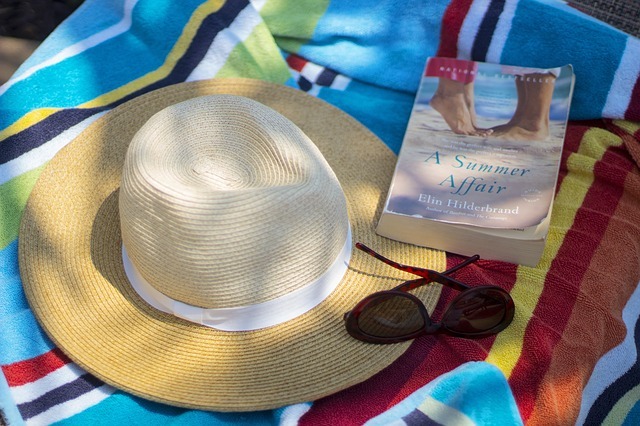 I love summertime reading and if I can be reading at the beach, I am in paradise! I recently ran across a fun readers survey (with the help of my blogger pal, Karen) compiled by Thriftbooks, a large web-based book seller. If you like buying books at a discount (who doesn’t? ), you might want to check them out. They also have an app that is awfully handy! My favorite part of the survey focused on how readers “buy, mark, and share books.” Buying new books was the top choice overall, with women buying more used books than men. How readers mark their places in books is quite interesting. Eight percent of the respondents rely on their memory to find where they stopped reading. I was totally impressed. This clearly isn’t something I do! 14% report turning the books facedown and 22% dog-ear the pages. I’m a bookmark gal myself, along with the majority of readers. As for writing in their books, 4% of readers always do, while 73% never do. So what do readers do with their books when they’ve finished reading them? 56% keep the books, 43% share them, and the rest either sell or recycle the books. So what are your reading habits? Do you buy new or used? Dog-ear? Hang onto the books you’ve read? I’m curious! Tag me new and used, bookmark, and share. I usually get my books from the local library. A few times from a friend. I purchase free books for my Kindle, loan them from the Library or friend, buy used books at book stores, consignment shops, & garage sales. Sometimes I splurge and purchase a new book especially if it’s part of my series/ trilogy. I even loan books on CD’s to play in my car while waiting on my son’s bus at the train or Greyhound station. I rarely dog-ear my books now (as an adult). Most books I buy I get from garage sales (sometimes as low as 25 cents each). At school I use a bookmark when on the read aloud chapter book and I make my kids use bookmarks (usually scraps of paper). I won’t let them dog ear the book or flip it over and leave it. At the end of the year I made all my students a crocheted bookmark to take home. As an adult I use a bookmark most of the time but sometimes just remember or find where I left off. I like new books but won’t buy unless I can get a discount or its a fundraiser. I buy used books majority of the time. I have to admit I’m a hoarder most of the time when it comes to books. I do share, trade and recycle but if I fall in love with a book I’ll keep it to read again. As a retired teacher, I have enough primary level books to fill a library! I have 6 young grandchildren and have encouraged reading all subjects since they were toddlers. We still love reading old favorites when we have sleepovers! They are all eager readers!